For Cupcakes: Preheat oven to 350°F (175°C). Line mini cupcake pan with paper cupcake liners. In medium bowl, mix together flour, sugar, baking soda, salt and cocoa powder. In large bowl, mix canola oil, milk and vinegar. Add half of dry ingredients into oil. When well combined, add peppermint extract. Slowly mix in remaining dry ingredients until fully combined and free of lumps. Scoop batter into cupcake liners with small ice cream scoop or spoon. Bake cupcakes for 12 minutes. Cool completely on rack. While cupcakes are cooling, make glaze. For Glaze: In saucepan, mix cream, chocolate, honey and coffee on low heat. Stir until smooth. Let cool. 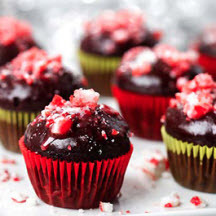 *To crush the peppermint candies, put them in a zip-top bag and crush with a rolling pin or use a food processor. Nutritional Information Per Serving (1/36 of recipe): Calories: 110; Total Fat: 5g; Saturated Fat: 1g; Cholesterol: 5mg; Total Carbs: 15g; Fiber: 0g; Sugar: 10g; Protein: 1g; Sodium: 100mg.